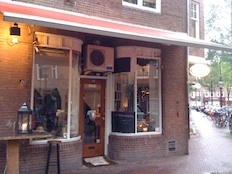 Dutch-Belgian couple Madelief and Jean Michel, the owners, describe Madelief as the slowest restaurant in the Netherlands. They want you to take the time to savor the flavors and enjoy your company. 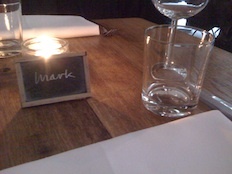 And they do their utmost to make you feel at home for an evening of traditional French dishes and wine. You might actually need some patience locating Madelief, off the beaten path in a residential street near Vondelpark, and marked only by a small table with a lantern and a chalkboard in the window with the daily specials. The inside is decorated sparsely, with bare brick walls, simple chairs and tables, visible cabling and the sliding mechanism of the bathroom door equipped with a big old jar filled with salt as counterweight. While simple, the decor is welcoming due to a lot of personal touches and eye for detail like your name written on a small chalkboard to hold your reservation. Everything puts you in the mood for slow food, although the chairs felt somewhat uncomfortable at the end of a long dinner. 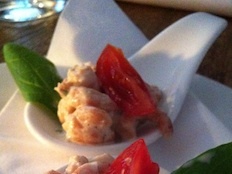 Having found our table, we were generously welcomed with an aperitif of pear cider and an amuse of very flavorful local North Sea shrimp. The menu is small and distinctly French. And the host was happy to help us navigate between paté and fois gras and suggest the right wines, of which a few special ones were not on the list. By now we had nicely settled down into slow food mode. And the starters of scallops with a wonderfully creamy saffron risotto and paté with quail and onion confit were well worth the wait. The many distinct flavors came together perfectly. The mains were equally satisfying. 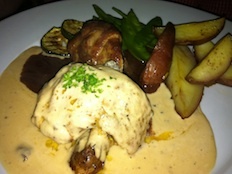 A well prepared monkfish with a smooth buttery sauce and, the highlight, quail filled with fois gras and an intense truffle sauce. Only for professionals, the menu had stated, and Madelief certainly had managed to get amazing flavors going in this dish. 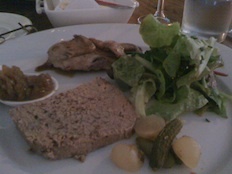 We loved the food, but would caution vegetarians and people with a distaste for fois gras against Madelief. Madelief is not for everyone, and that’s exactly how the hosts intend it to be. 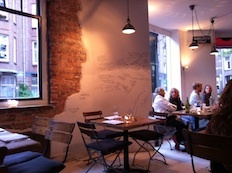 But if you are a foodie who enjoys traditional cooking and loves to take their time savoring their flavors, you must venture out to Zocherstraat and pay Madelief and Jean Michel a visit. Ask them for recommendations and let them guide you through a slow paced evening of wining and dining.